When choosing products made from metal, it is important to understand the properties of the metal that the product is made of. Without understanding the property of the metal required for your product or other applications, you would not be able to get the most suitable one for your specific needs. Cast iron and mild steel are commonly used metals. However, they cannot be interchanged as far as their applications are concerned. Let’s check out the difference in properties of cast iron and mild steel to understand their characteristics in a better manner. Cast iron is an iron alloy with an amount of carbon superior to 2.11% is considered cast iron (whereas steels have an amount of carbon inferior to 2.11%). The carbon content in cast iron generally ranges from 2% to 4%. The most notable thing about its structure is that cast iron has graphite inclusions at the micro level. Mild steel is an Iron-carbon alloy containing less than 0.25 percent carbon which makes it more ductile and less hard thus rendering it unsuitable for structural work. Cast iron has a lower melting point (12000C) as compared to the melting point of mild steel which lies in the range of 13000C and 14000C. Cast iron is easier to work with when it comes to casting shapes out of the material. Due to the extra carbon present in cast iron, it’s molten form is more fluid and this makes it easier to cast the material into complex shapes. This is highly suitable for casting large and heavy objects. Mild steel is also easy to work with but cast iron has higher castability. Cast iron is hard and it can be hardened by heating and sudden cooling. This makes it quite durable. Mild steel can be hardened and tempered by using relevant processes. The compressive strength of cast iron is 6.3 – 7.1 tonnes / sq. cm. It’s ultimate tensile strength is 1.26 – 1.57 tonnes / sq. cm. The compressive strength of mild steel is 4.75 – 25.2 tonnes / sq. cm. It’s ultimate tensile strength is 5.51 – 11.02 tonnes / sq. cm. This clearly shows that mild steel is a better option than cast iron when it comes to ultimate tensile strength. However, cast iron has better compressive strength than mild steel. Due to this, it will have greater resistance against breaking under compression. This also makes it quite durable and ideal for rugged use. It will not show signs of wear and tear easily and you can expect long term performance from cast iron. Ductile materials such as mild steel are difficult to machine because they deform plastically beyond yield point and tend to produce continuous chips which tries to stick on the sample, thereby hindering the cutting ability. Brittle material such as cast iron are almost elastic up to ultimate tensile strength and produce discontinuous chips which break away from the sample easily. This helps to improve the cutting ability. Due to this, cast iron is the preferred material when it comes to high machinability and strength. Cast iron has good damping property which absorb the vibrations. Hence there are used for making bed for the machines. Consider the cast iron as a composite with pearlite as matrix and graphite as the dispersed phase. It is this dispersed phase which causes a number of reflections of the vibrations and eventually causes it to fade away. 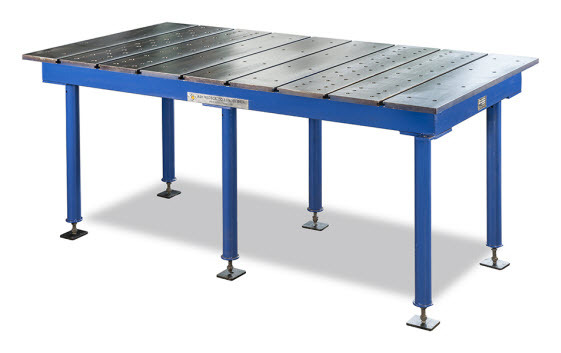 This is what makes cast iron the best material for bed clamps, pallet sub tables, box angle plates and surface tables.